Lars, a very interesting post. Thanks. Thanks Tom…more to come. I promise. Reblogged this on Money or Debt. Really good analysis Lars. Just one minor thing to add. The crisis hit eastern Europe in the fall of 2008. 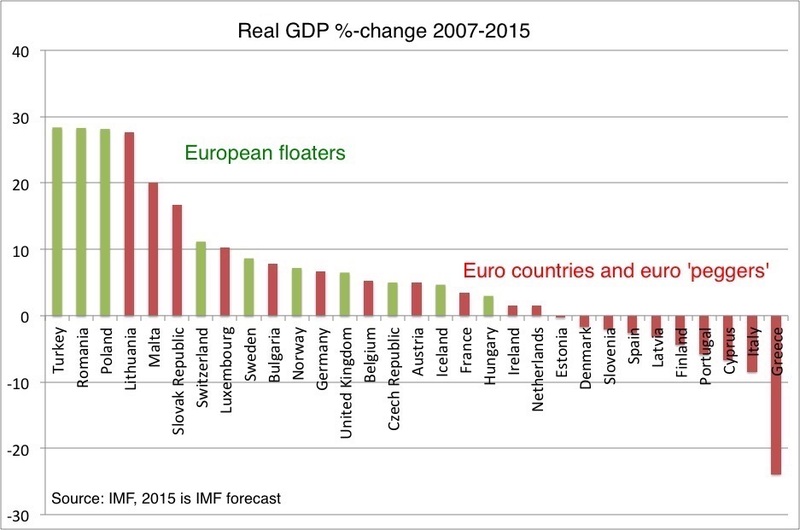 Thus for Romania only in the first quarter of 2015 did real GDP achieve the maximum it achieved at the end of 2008. If NBR would have allowed the currency to fluctuate freely, now it is a tightly managed float, than Romania would have recovered much faster. So, yes I do back up your view. Would be even more interesting to have the per capita GDP figures as well. Some countries have had significant population growth in the period under consideration. Also, debt figures would be extremely helpful for our analysis. Lars what about Corruption, debt, or a combinations of both, with or without the Euro o alternatively pegged countries? I think what you are suggesting that, for instance, Greece’s crisis would have been solved outside the Eurozone? IF that is the case, why they do not do it? Get outside the Euro for few years and return to it after healing. Looking carefully to the graphic I got the feeling that what you have found is more a spurious correlation, than a sound relationship between growth and the exchange rate/monetary system. I do not like the “if” conditional, it could take me to an artificial scenery. What about if you correlate public debt and economic growth, both in per capita terms? You would have got different picture, and different answers to a same problems to highly indebted countries. That’s the expression I was looking for: ‘spurious correlation’. This is not scientifically sound, when you consider so few relatives. Surely, the countries’ relation to the Euro cannot be the only factor to consider. But a critical look at the EEC is always desirable. This is an objective view of the situation, I maintain that the rot had already been introduced when the euro was launched, as a result of the huge retail, overnight price hike in Southern economies on changeover to the euro. Coupled with a dramatic shift in industrial production to Far Eastern economies, the Southern states never found a firm footing. hubris would not allow it. The Troika has critically damaged the economy and a debt deflation spiral has taken hold ;there is no easy solution. I enjoy reading your often provocative pieces but when I want to comment, i need a wordpress account. Is that common? Also, imo your comparison between non EUR countries and EUR/peg ones is rather cheeky: suggestive but why not started at the start of the EUR and why not added a comparison in some kind of common currency or on a PPP basis. I think the EUR is a marvelous integrative tool and it will force change in a way only civil wars can. If you believe that the softer members in the club need to be bullied into acceptable levels of resilience, or leave the club, this is a good way to do it. It worked for East Germany and it will work for Greece. It would even work for Ukraine..
Of course monetarists deal with the cycle, not with growth and the EUR is part of a grand project aiming at creating a superstate. That said MM would have been a better ECB approach than the half hearted application of German benign neglect for countercyclical monetary policy, if one ignores the need for fiscal discipline, But disobedient Greece (especially in the presence of compliant Ireland) presented a not to be missed opportunity to do as the Chinese say: kill the (Greek) chicken to scare the (latin) Monkey.. So I guess the Germans made a move. It may work out and Europe will integrate (into Germany) faster, or we have another German historical turning point where overreach is followed by collapse. Stalingrad or 1870. Bismarck or Schicklgruber, Frau Sauer’s choice. Interesting! Anyway, could you let me know how I comment (maye in a more restrained fashion) without WordPress? Rien, I think it should be working now. You say the euro a great integration mechanism. Well, to me it is a growth killing machine, which has INCREASE political disunity to an rather extreme degree. In would love not like to be a German tourists in Spain or Greece these days. Forcing a depression a country like Greece is not something that helps reforms. Rather it leads to the rise of extremist parties such as Syriza and Golden Dawn. In the 1930s monetary strangulation led to the rise of the nazi party. We all know the catastrophic consequences of that. I would not like something like that to happen again. Change cannot be forced on a country from abroad – unless you want full-scale colonization. Of course if the ask the man in the street in Athens today they will say that this is exactly what is happening and I wouldn’t necessarily disagree. By the way I disagree that Eastern Germany has worked out especially well. Monetary unionification probably was unavoidable, but the Bundesbank’s reaction to it was catastrophic. Today the Bundesbank is pushing for the same kind of policies in Europe as it was pushing in German in the first years follow re-unification. That is depressing. The continued rejection of the Drachma by the Greek people is the strange thing. It is a genuine fear of their own uselessness at running a currency, fear of their politicians, but also the fear of inflation. This inflation bogeyman permeates the world, from the head of Fed to the Greek pensioner and is the fear that really needs to be faced down. The amount of the fear tells you NGDP targeting has a very long educational road ahead. Um…no, the introduction of a currency takes time and has to be planned. It took over a year for the Americans to attempt to do it in Iraq and still forgeries, counterfeiting and chaos ensued. It takes time and money to print notes and have a central bank in place and notes of the old currency have to be printed as a stopgap measure . If the ECB stopped accepting Euros in Greek banks as Euros, de facto Greece would be out of the Euro, and be in a world of Greek Euros, or Greuros. It would be overnight. The Euro notes and coins in curculation in Greece are irrelevant as they are only about 5-10% if broad money. The Greek central bank could easily “print” Greuros electronically by expanding its balance sheet by fiat. It is does it now via the ELA but needs the approval of the ECB for those new Euros to be considered real Euros. If the monetary union had started with Germany, the Benelux, and possibly France or Austria (certainly the UK, had they been interested), to then expand with several countries per decade, things would have been very different. Great graph. Have used in my online review of Bernard Connolly’s book, which I read because you recommended it. What will happen if we use data of 2001-2015? Shouldn’t you start the analysis a bit farther back? If peggers outperform floaters during the boom years, they could (economically speaking) get far enough ahead that their lag during the bust years winds up with them still being ahead, even with a lagging recovery. Either way, I’m not certain you’re making the full case without looking at both boom and bust years. Is it naughty to say I love your German PPS? Mark Sadowski makes a critical point at TMI: 2008-9 was when monetary policy had the largest impact — as MMs have been patiently explaining for a long time, that’s the time when NGDPLT looks very different than IT. “and also making some concrete predictions” …. YES!… falsifiable predictions. That’s pretty much the only reliable way to start to know anything about objective reality. What I find is that those who are on the Right who support the EU do so because they believe that the EU will force countries against their will to accept ‘neoliberal’ policies whereas Leftists who support the EU do so because they believe the EU will force countries to against their will to accept ‘socialist’ policies. I put these words-‘neoliberal’, ‘socialist’-in scare quotes as these are the terms that in both cases the other side dismisses them as. I think that any thinking person whether on the Right or Left should be able to agree that it’s up to the people of each country what kind of monetary or fiscal policies-whether we who do not live there agree or not. Fact: Poland and Romania wouldn’t have grown as much if it werent for the European union, sponsored heavily by, you guessed it, euro countries. Also to call Turkey a European country is incredibly debatable. It’s in the Council of Europe and subject to the EHCR Poland and romania grew because of foreign remittances. Un disastro anche per i primi della classe | Buseca ن! Je li vrijeme za tranziciju? | Tko je John Galt?